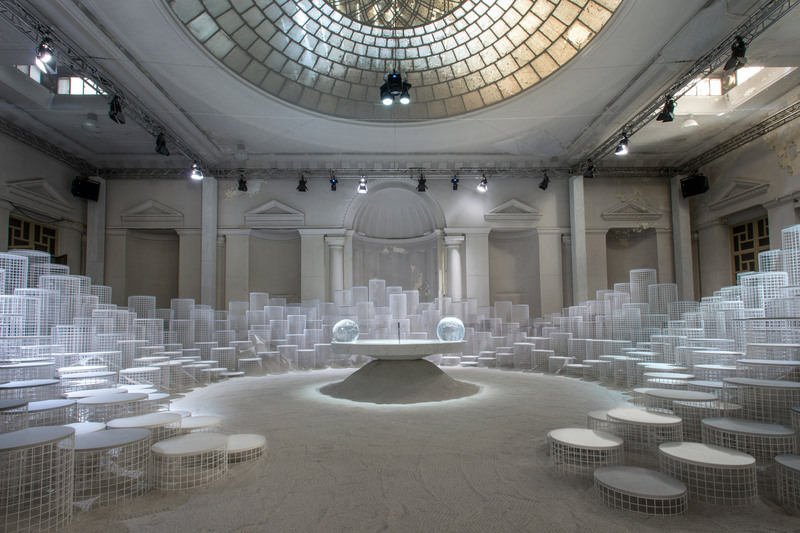 Snarkitecture and Caesarstone have teamed up to create an installation exploring the changing forms of water, which was set inside an abandoned 19th-century building during this year's Milan design week. 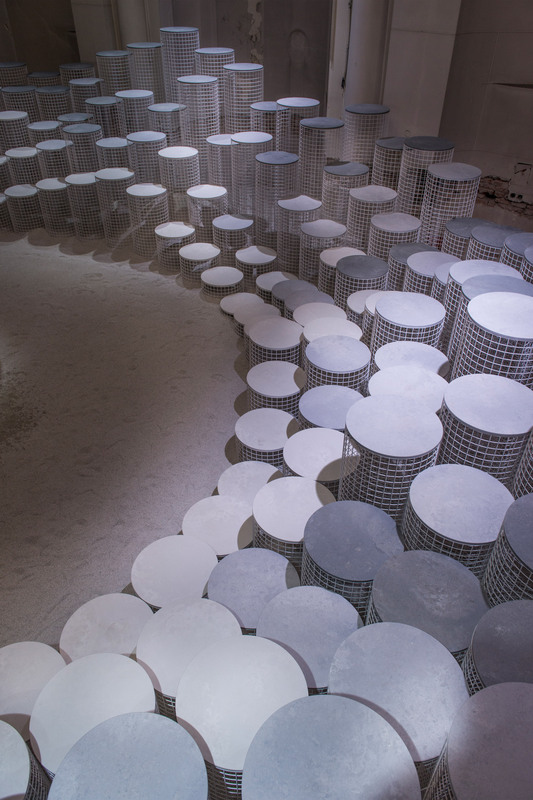 The Altered States installation was exhibited at Palazzo dell'Ufficio Elettorale di Porta Romana during this year's Milan design week, which came to a close yesterday, 22 April 2018. The abandoned building, completed in the 19th-century, was opened up to the public for the first time in 14 years throughout the duration of the festival. 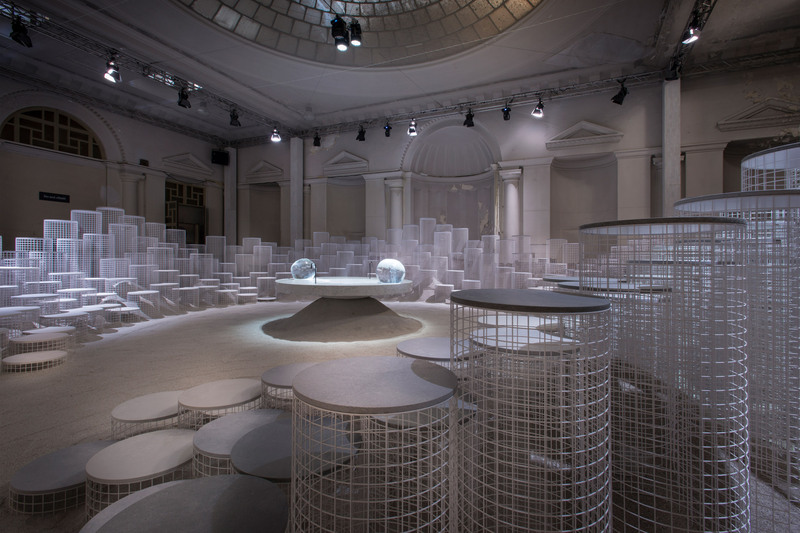 For the installation, Snarkitecture looked at water as a kitchen ingredient, looking at its changing states both in nature – as glacier, river and geyser – and in the kitchen – as ice, liquid and steam. "The initial brief from Caesarstone was to focus on the kitchen island and to really think about it as the hub of the home – a place where we cook, eat, entertain, work, interact and socialise," Snarkitecture co-founder Alex Mustonen told Dezeen. "When we were thinking about this, we found that this concept aligned with many of the goals of our practice, which are to create architecture that's accessible and engaging and interactive." "We wanted to create three separate experiences that would each encourage their own kind of interaction, and each with their own state of matter," he continued. 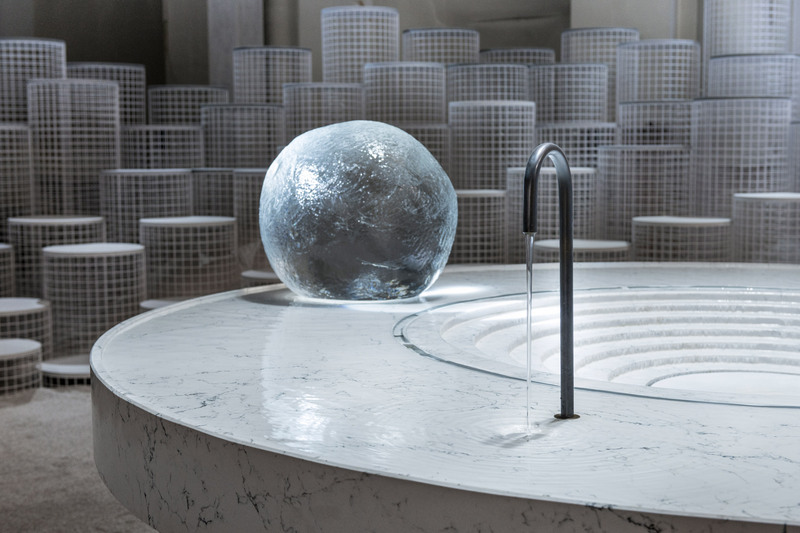 The partnership between the two launched in January, when Snarkitecture sculpted a series of kitchen islands using layers of Caesarstone's quartz surface material. The initial series of islands were presented in Toronto at the Interior Design Show, which took place in January. While these pieces were finished works in themselves, the firm saw them as "studies" or "sketches" for the final outcome at Milan. 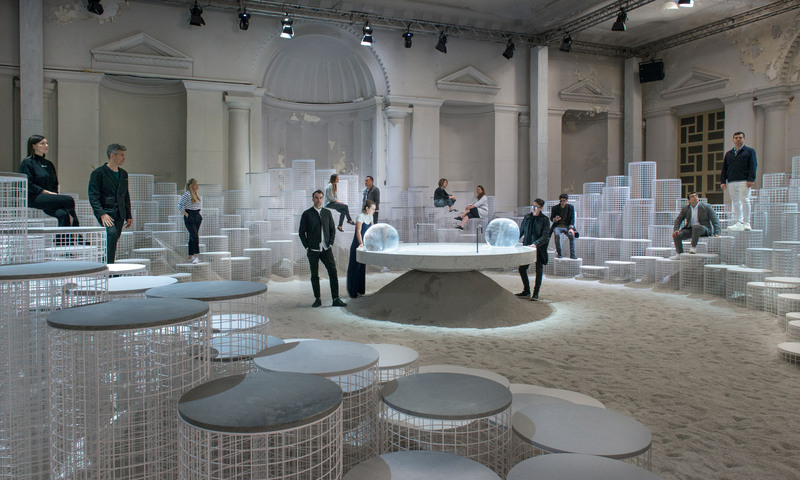 The installation featured one central island that united all three states of matter, linked together by the Caesarstone material. This island had two spheres of ice that gradually melted into water, which then cascaded down the series of stacked slabs of Caesarstone onto a hot surface that transpires into steam. Built up in layers, the multiple surfaces are designed to reference a natural topography. Encircling this central island was an amphitheatre made up of over 250 undulating seating platforms, set at irregular heights to also emulate a natural landscape. 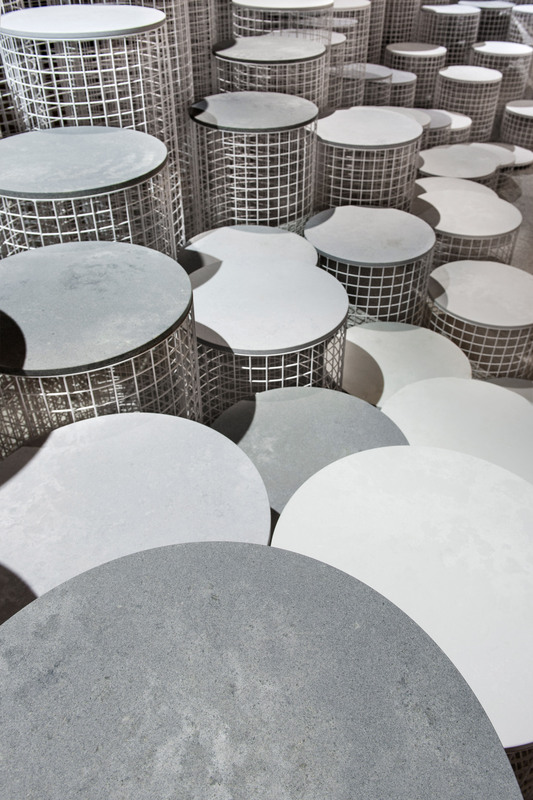 These pedestals are formed from Caesarstone concrete and a lightweight steel mesh structure, coloured in shades ranging from grey to white to create a monochromatic gradient effect. "There are elements in the installation that are very familiar to ordinary kitchen islands, that i think you recognise as things that might be in your kitchen, or one that you've been in. But there's clearly some things that are very different," said Mustonen. "For us, its about taking this idea of something that's familiar, and something that you know from your everyday experience, and finding a way to reimagine or to reinterpret it." The island also featured faucets that, instead of pouring into a sink, pour onto its outer surface – creating a shallow pool that tricks the eye into thinking it is a flat surface. The frozen globes are designed to have the appearance of balls of glass. "All of this dynamic movement created by the altered states creates something that's reflective. It's a moment to pause, relax and hopefully contemplate the way that our design architecture affects our everyday environment," said Mustonen. The Altered States installation was the first and only time the palazzo was used in the context of its existing state, as plans have been revealed for it to be renovated and converted into a hotel. Parts of the interior will be designed by Israeli architects Baranowitz Kronenberg, however further details about its developments are not yet available. American artist Phillip K Smith III also chose a historic setting to house a modern installation at the design festival, which drew to a close on the 22 April 2018. He worked with fashion brand COS to install a faceted mirror structure in the courtyard of a 16th-century palazzo.